Leave it to Texas Motor Speedway President Eddie Gossage to come up with a clever marketing gimmick to promote Monster Energy NASCAR Cup Series races at his track in Fort Worth. His latest promo took advantage of the rivalry, of sorts, between the “old guys” and the “future stars” of the sport and played on the the popularity of one of the “boy bands” from the the era of the “old guys” — New Kids on the Block. 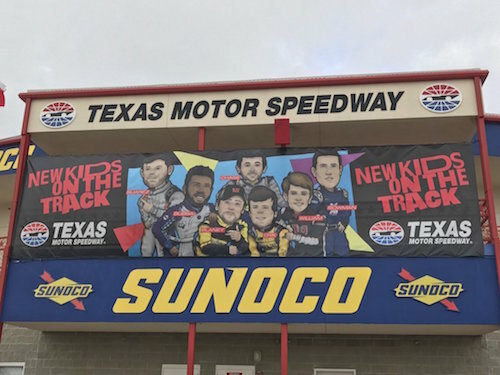 I have to say it was clever to feature the young up-and-comers as members one of the old-time boy bands, NKOTB, through banners around the TMS grounds and a video that played on the track’s big screen, a.k.a. “Big Hoss,” during the recent O’Reilly Auto Parts 500 race weekend. I can totally relate to the “old guys,” as I’m only two days younger than Kevin Harvick, I was born the same year as Jimmie Johnson, and I was born in the same decade as Clint Bowyer. I also was born within five years of reigning Cup Series champion Martin Truex Jr. That’s not too shabby company to be a part of since it accounts for the latest Cup Series championship, a record-matching seven-time championship driver and five of the seven race wins so far in 2018. I was in middle school during the heyday of NKOTB, so I guess it could be said that I was in that sweet spot of the group’s primary audience. I listened to the New Kids, but I wasn’t obsessed and didn’t have my fave group member like some of my middle-school peers. I have to admit, this promo kind of left me wondering if the old guard of Harvick and Johnson were listening to NKOTB when they were in middle school then, too. I also have to admit, though, that the thought that these up-and-comers, the “future stars” of the sport weren’t even born in time to experience all the NKOTB craziness kind of made me feel a little old. Boy, they sure missed out. Justin Bieber doesn’t compare to Jordan and Jonathan Knight, Donnie Wahlberg, Danny Wood and Joey McIntyre. Oh well, they do have actor Wahlberg. That’s better than nothing I guess. I enjoy taking in an episode of his TV show, “Blue Bloods” every now and then. I have a pretty good feeling the youngsters like Chase Elliott and Erik Jones would struggle to name all five members of NKOTB. Do they even know Wahlberg as anything other than an actor? Do they see him in “Blue Bloods” and realize he was once a boy band “bad boy?” Probably not. Anyway, thanks, Eddie Gossage, for the fond memories of my middle-school days. Meanwhile, I’ll celebrate my generation’s successes of 2018, so far, and there are plenty. After all, 2018 is shaping up to be the year of the “old guys.” Harvick and Johnson have pretty much confirmed it on Twitter, and Harvick has proven it on the race track, especially with his three-straight wins, along with one each from Bowyer and Truex. Those a references probably lost on the youngsters, but I digress.